Good morning all. Our Guest Designer Patty is getting a head start on her holiday cards, and she's sharing one with us today. 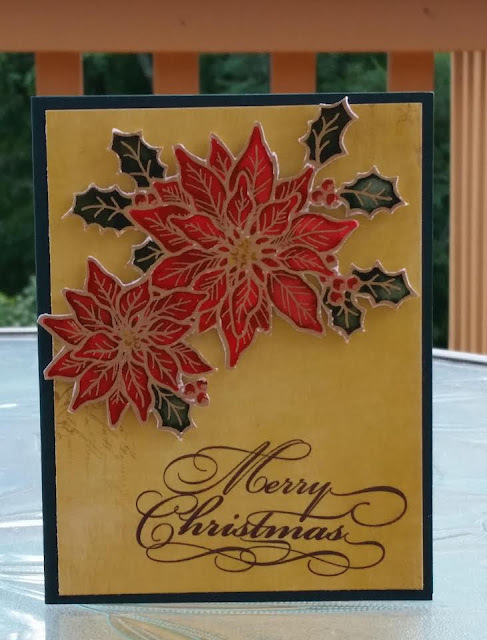 Patty used the beautiful Poinsettias & Berry stamp, which she cut out and popped up over the Elegant Merry Christmas Sentiment. She did a beautiful job! Make sure you stop by Patty's Blog for all of the details on how she created today's card. There is still time to play along with our current Great Impressions Challenge. Make you stop by for all of the details, and if you use some Great Impressions Stamps make sure you link them up in our Customer Gallery!